I never thought I would be writing about microwavable Salmon that. That was until I was introduced to Rebel Salmon. Rebel Salmon is FRESH, unfrozen salmon that comes with seasoning and a cooking tray, allowing you to go from fresh to finished in 90 seconds. Even upon receiving Rebel Fish, I was still a little hesitant. When I opened the packet up, I instantly noticed the freshness of the filet. 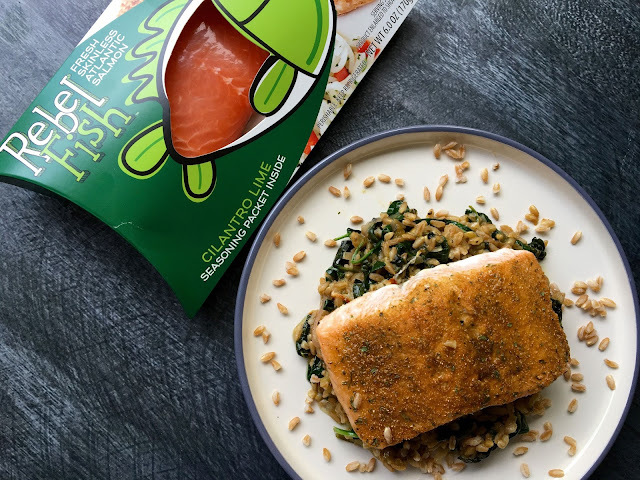 I decided to use leftover Farro and make a Farro Spinach salad to go along with the Cilantro Lime rubbed Rebel Fish. I had an amazingly delicious and healthy lunch in less than 5 minutes from start to finish. I was shocked as to how amazing this 90 second Salmon tasted. For those who don't use microwaves, there are also oven directions. Add your spinach to a sautee pan with 1 tablespoon of olive oil. Cook for one minute, add your leftover cooked Farro, cilantro, lime juice, salt and pepper. Sautee for 5 minutes or until Spinach is cooked through. 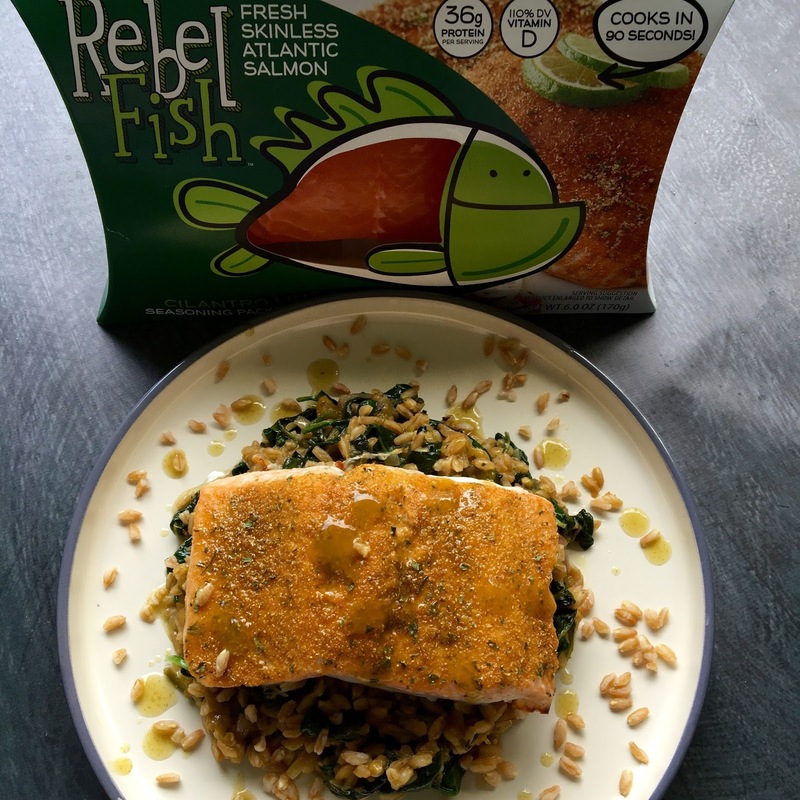 Cook Rebel Fish Salmon (90 seconds in microwave). Add jalapeno hot sauce if you want to add a little heat! 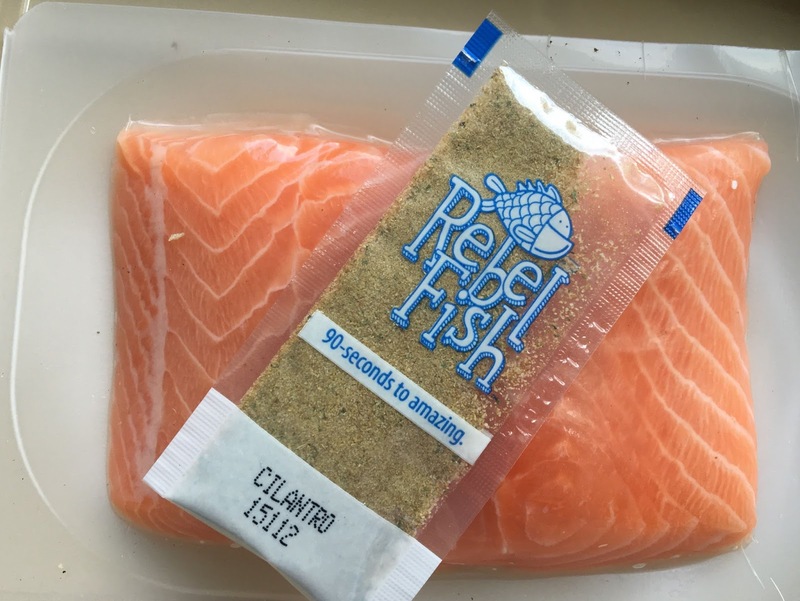 Rebel Fish comes in a variety of rubs. Along with the Cilantro Lime featured in this recipe, the other rubs are: Lemon Pepper Herb, Barbecue, Maple mesquite smoked sea salt, Cajun blackened, Thai chili. You can find Rebel Fish retailers on their website, click here to find one closest to you.